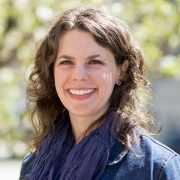 Amy Bucher, Ph.D., works in Behavior Change Design at Mad*Pow, a purpose-driven strategic design agency in Boston. Amy focuses on crafting engaging and motivating experiences that help people change behaviors that contribute to physical, mental, and financial health and well-being. Before joining Mad*Pow in 2016, Amy worked on behavior change products in-house at CVS Health and Johnson & Johnson. Amy received her A.B. from Harvard University, and her M.A. and Ph.D. in organizational psychology from the University of Michigan, Ann Arbor. She’s a frequent speaker at behavior change and UX conferences where she talks about motivation, engagement, and product design.